Beachfront. Large Luxury Condo. Sleeps 8. Call/Email for December Discounts! ! You are invited to stay with us at Grandview East for a spectacular beach vacation! 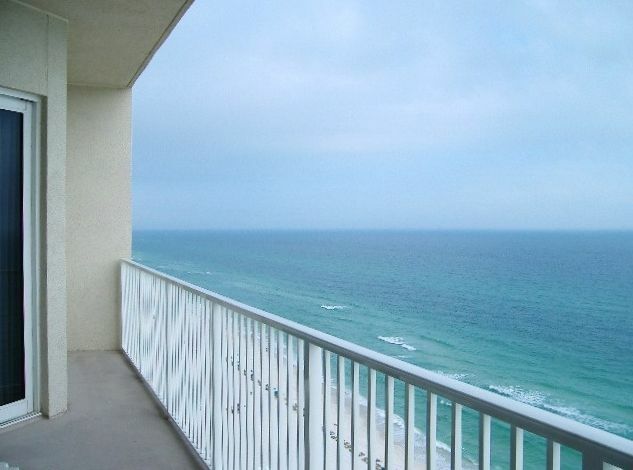 Our condo is located directly on the Gulf with gorgeous unobstructed beach and water views from the Master Bedroom, Balcony, and the entire living area. You will enjoy incredible panoramic views up and down the beach as far as the eye can see. Crack open the sliding glass doors in the Master Bedroom and Living Room to hear the pounding surf! Grandview East also offers a seasonally heated pool, covered and uncovered parking, on-site management, and security. This is a large,(about 1500 sg. ft.),Gulf front,three bedroom unit, with sleeping accommodations for up to eight guests. Master Bedroom and Living Room are both connected to the balcony by sliding glass doors. High ceilings (9 ft. and 10 ft.) give an extra spacious feel to all rooms. Free daily beach service, two lounge chairs and a large beach umbrella, and Free WIFI are both included in the rate! Amenities include a fully-equipped kitchen, free high-speed internet access, three TV's and DVD Players, and full-size washer and dryer. There are stainless steel appliances, stunning granite counter tops, two-person marble spa tub, and a separate over-sized shower in the Master Bath. In your beach 'home away from home' you will have everything needed to have a very enjoyable vacation - soft, comfortable furniture, pillow-top king bed, soft sheets and towels. Grandview East is centrally located for you to enjoy the many Panama City Beach vacation activities. Saint Andrews State Park, restaurants, golf courses, specialty shops, convenience stores, and fast food outlets are all nearby. Family oriented activities such as miniature golf, movie theaters, and amusement parks, as well as tons of shopping are close. New Pier Point Shopping Mall is less than three miles away. Best of all, Grandview East is a smaller, intimate complex offering faster elevator service, closer parking, and a less crowded beach. Condo building is directly on the beach. Living area and master bedroom face the Gulf. Local, calling card & toll free. Pool is seasonally heated and partially covered. Exercise room with view of the beach. Making the reservation was a simple smooth process. Harry's condo was so nice, loved everything about the resort. Thank you for letting us enjoy our vacation in your place. We had a wonderful stay and Mr. Adcock was very easy to communicate with and rent from. The condo was nicely furnished and the view was astonishing. The condo was perfect for our group of 7. The beds were comfortable and the master bedroom is lovely! The elevators were fast and the facilities were very well maintained. We stayed during the week of July 4th, which is a very busy time, and were impressed with the family friendly atmosphere of the condominium. I would definitely recommend this unit to friends and family. We will rent it again if it is available. It was very nice and clean and had a great view! I thought it was very clean and well kept and the view was awesome, great access to the beach and i would recommend this place to anyone. Condo was very roomy and slep 8 comfortably. Did not see a crock pot so bring your own. Had some elevator problems but were quickly resolved. Over all it was a great vacation. The condo was beautiful. Everything is very high quality and the furniture was very comfortable. I am afraid of heights and did not realize that this was on the 16th floor so I was nervous the first time I walked out onto the balcony. The view was so amazing that I quickly overcame any fears. The only thing we wish we could have changed was the length of our stay. We would have stayed longer!! Mr. Adcock should be very proud of his condo and the product he has to offer. My family and I fell in love with this condo. It is beautifully decorated and extremely clean. It is also very spacious. Mr. Adcock is a pleasure to rent from. We highly recommend renting this condo and we can't wait to stay here again next year! Grandview East is centrally located for you to enjoy the many Panama City Beach vacation activities. Saint Andrews State Park, restaurants, golf courses, specialty shops, convenience stores, and fast food outlets are all nearby. Family oriented activities such as miniature golf, movie theaters, and amusement parks, as well as tons of shopping are close. New Pier Point Shopping Mall is less than three miles away. Best of all, Grandview East is a smaller, intimate, complex offering faster elevator service, closer parking, and a less crowded beach. PLEASE NOTE THAT ACTUAL RATE TOTAL MAY BE LOWER THAN QUOTABLE RATES DUE TO AVAILABLE DISCOUNTS! CALL OR EMAIL FOR AN ALL-INCLUSIVE TOTAL FOR YOUR DATES. REFUNDABLE DEPOSIT OF $250 IS NOT INCLUDED IN THE INSTANT QUOTE AND MAY BE HIGHER FOR LARGER GROUPS OR DURING CERTAIN SEASONS OF THE YEAR.